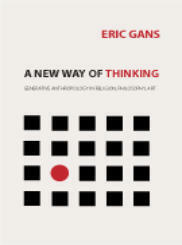 Title: A New Way of Thinking: Generative Thinking in Religion, Philosophy, Art Author: Eric Gans Imprint: The Davies Group, Publishers soft cover 310 pp. USD 28.00 US ISBN 9781934542255 2011 A New Way of Thinking locates the major areas of human representation, religion, philosophy, and art, in the context of the originary hypothesis: given the scenic nature of all the forms of human culture, the human is best understood as having its roots in a scene of origin. When prehuman intelligence outgrows the peacekeeping capacity of the ape pecking order, humanity begins as a community symmetrically arrayed around a central desire-object whose very desirability makes it sacred and therefore forbidden. The reconceptualization of the forms of human culture in scenic terms provides a new approach to the tired controversy of whether or how we can speak of God. It explains the limits of philosophy and situates its project within rather than above that of universal morality. Finally, it elaborates a scenic theory of art and explains in its terms the difference between “popular” and “high” art, and the reasons why this distinction is increasingly less useful. The book includes a running footnote dialogue with fellow Generative Anthropologist Adam Katz. Contents Part One — Religion Chapter 1 Why Do We Believe in GA? Chapter 2 Transcendence Chapter 3 Transcendence and Cultural Will Chapter 4 The Question of Transcendence: An Update Chapter 5 The New Anthropic Principle Chapter 6 Believing in GA Chapter 7 Notes for a History of Transcendence Chapter 8 A Minimal Theodicy: God Helps Those Who Help Themselves Chapter 9 Cosmic Optimism Chapter 10 Religion and Originary Anthropology Chapter 11 Intelligent Design? Chapter 12 Return of the Sacred I - The Sacred and the Significant Chapter 13 Return of the Sacred II - Secularism Chapter 14 Tragedy and Christianity: Minimal and Maximal Faith Part Two — Philosophy Chapter 15 Monism or Dualism? Chapter 16 Philosophy to Metaphysics I Chapter 17 Pre-Socratics II: Parmenides, Heraclitus, and Anaximander Chapter 18 Pre-Socratics III: Xenophanes and Theology Chapter 19 John Rawls’ Originary Theory of Justice Chapter 20 Richard Rorty's Metaphysics Chapter 21 From Phenomenology to Generative Anthropology Chapter 22 Ecriture from Barthes to GA Chapter 23 The Fundamental Paradox of Signification Part Three — Art Chapter 24 Why Art Defies Analysis Chapter 25 The Esthetic Moment Chapter 26 The Sublime and the Beautiful Chapter 27 High and Low Esthetics Chapter 28 Popular Culture Is All We’ve Got Chapter 29 On Realism Chapter 30 Art and Otherness Chapter 31 New Thoughts on Originary Narrative Chapter 32 Poetic Justice: Notes on the Classical Esthetic Chapter 33 Story and Plot Chapter 34 Hermeneutics Chapter 35 The Dancer from the Dance) Author Eric Gans received his doctorate in Romance Languages in 1966 under the direction of René Girard. He has taught French literature, critical theory, and film at UCLA since 1969, and published books and articles on aesthetic theory as well as Flaubert, Musset, Racine, and other French writers. Beginning with The Origin of Language (1981), Gans developed the concept of Generative Anthropology and has written several other books on the subject, including Science and Faith (1990), Originary Thinking (1993), Signs of Paradox (1997), and The Scenic Imagination: Originary Thinking from Hobbes to the Present Day (2007). Carole Landis: A Most Beautiful Girl, a life of the American actress (1919–1948), appeared in 2008. In 1995 Gans founded the electronic journal Anthropoetics: The Journal of Generative Anthropology (www.anthropoetics.ucla.edu), which he has continued to edit through 33 semi-annual issues; he has also written over 400 web essays in the associated series of Chronicles of Love and Resentment. Adam Katz, The Originary Hypothesis: A Minimal Proposal for Humanistic Inquiry brings together a series of new essays by collaborators of Gans and Gans himself that demonstrate the sophistication and applicability of Gans’ hypothesis as well as its ability to transcend formalistic and narrowly disciplinary approaches to the arts and social sciences.